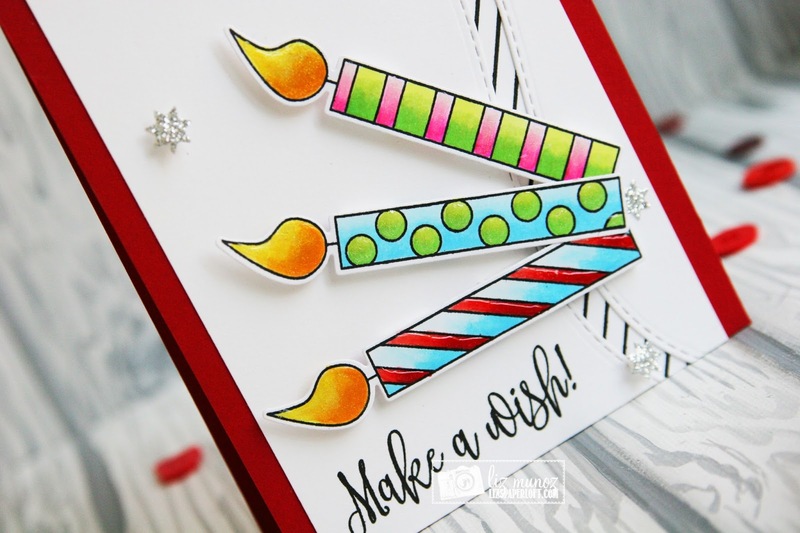 Liz's Paper Loft: MCT 55th Edition Sneak Peek #3 ~ wish big! to make these candles pop off the page. 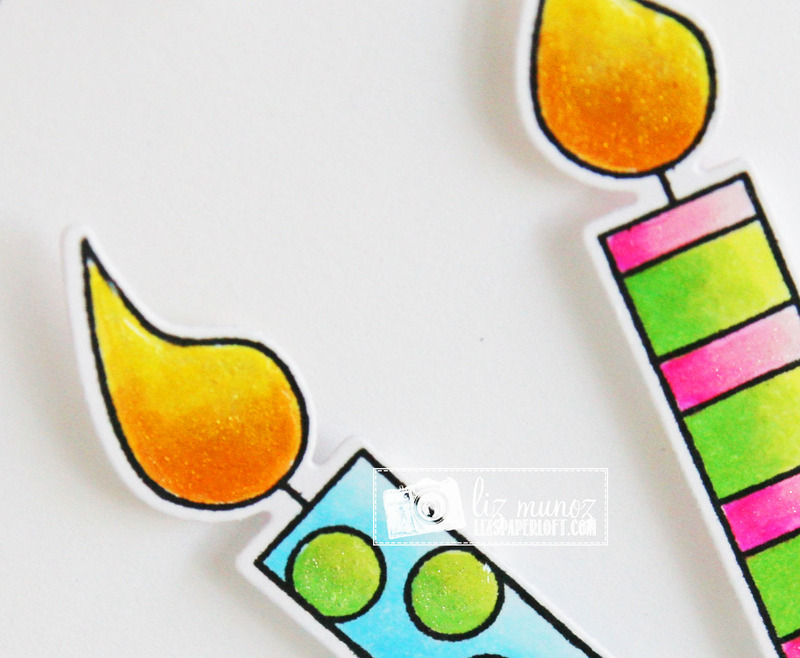 This is a bright and cheerful card! OMG Miss Liz What a Gorgeous Card!! love all of your ever so clever and creative ideas.....using Miss Emma's goodies!! The white with black & white stripe & red makes for a stunning look! SUper fab coloring job too! You so outdid yourself!! Great creative job!! YOU so ROCK!! Love your candles and layout. Gorgeous card and coloring. The candles really do 'pop' off the page. Receiving your cute card would make anyone's birthday happy. Love it! Terrific card! Wonderful color choices and I love the split layer to the right! I love this card, Liz! Fabulous coloring and the design is just awesome! Thanks for sharing your fantastic card. I loVe your design and how you colored up your candles. Wonderful card! 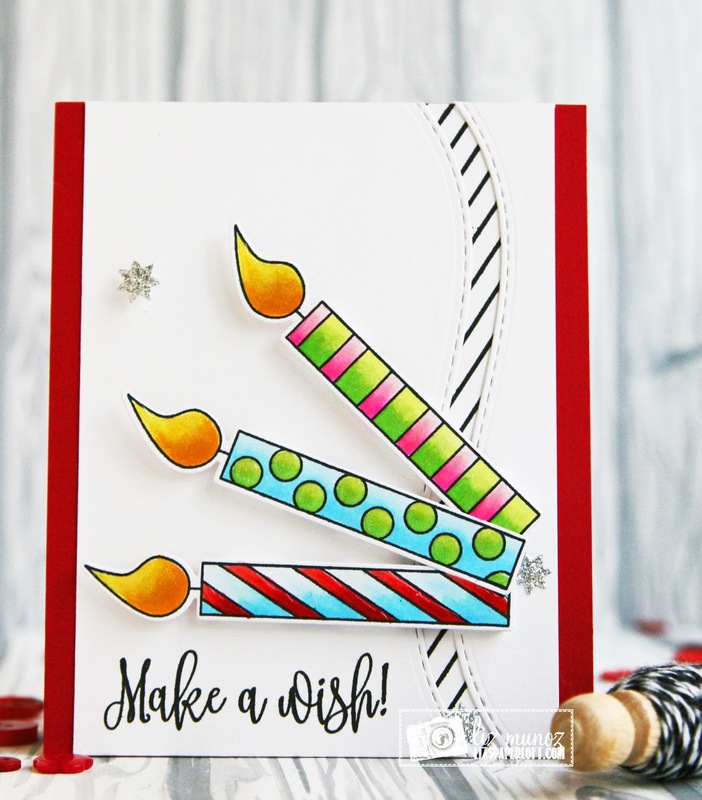 Your coloring is so nice and colorful, and I love the extra element of the channel you created toward the side; it really adds a lot of interest to the card and makes it a cut above the rest. This really is a fun new stamp and die set! Really nice card. I like the way you put the candles sideways. Liz I really love your card, very interesting and what fun colors you chose, great job! Love that your candles are sideways. So cute and colorful. Great card!!! Gorgeous card! AMAZING design and your colouring is absolutely wonderful! Love your colour blending on the candles! Really love the larger candles and sentiments! Can't wait to see the whole set. Very fun and colorful card design you created for Emma. What a great card! Love the layout and colors you used. Fantastic! What a fun card! Love this new set so much. I'm sure Miss Emma loved it. Such a clever card this one is - love the colors and the styling! I am sure Emma loved this adorable card! Love the colors and dimension your shading gave the candles. Beautiful design idea to have that stripe paper you stamped show through like that. Fabulous card. Such a FUN birthday card! Super cute design Liz! Your card is so cheery, love it!